The first business days of 2017 have seen the FTSE 100 reach a new all-time high of 7195. Although some commentators have expressed pessimism about the outlook for the UK economy, UK stock prices have continued to move higher. These gains can be partly explained by the importance of overseas earnings to the companies within the index, it also highlights that that the trajectory around economic growth does not always fit with what happens to stock prices in the short term. This phenomena is described as the stock market being more like a voting machine than a weighing machine. In other words, prices can change more rapidly than the underlying value they are said to represent. 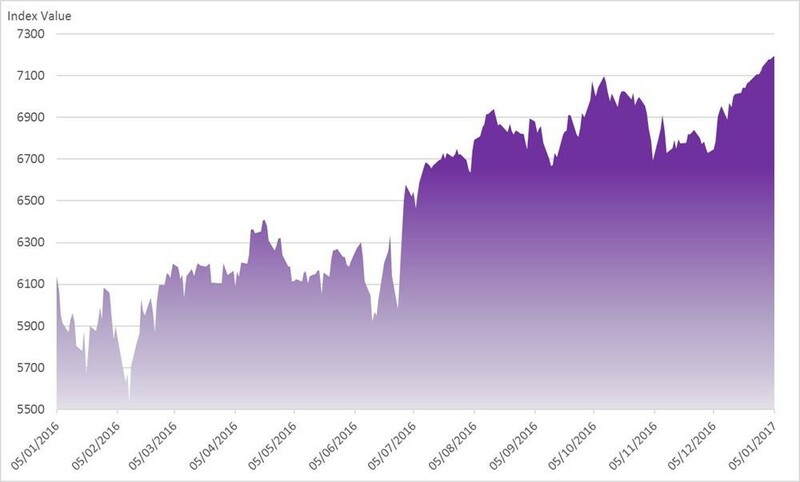 Nevertheless, the FTSE 100 is important when thinking about wealth effects – a potentially significant factor in driving consumer spending, which makes up the bulk of UK Gross Domestic Product (GDP), a common indicator used to measure economic growth. Basically, when people see their wealth growing they feel more confident about spending. One of the leading indicators for economic growth, the Purchasing Managers Index (PMI), was released this week, recording the December’s data for 2016 and capping off what has been a better backdrop than the negative headlines that feature regularly in the media. 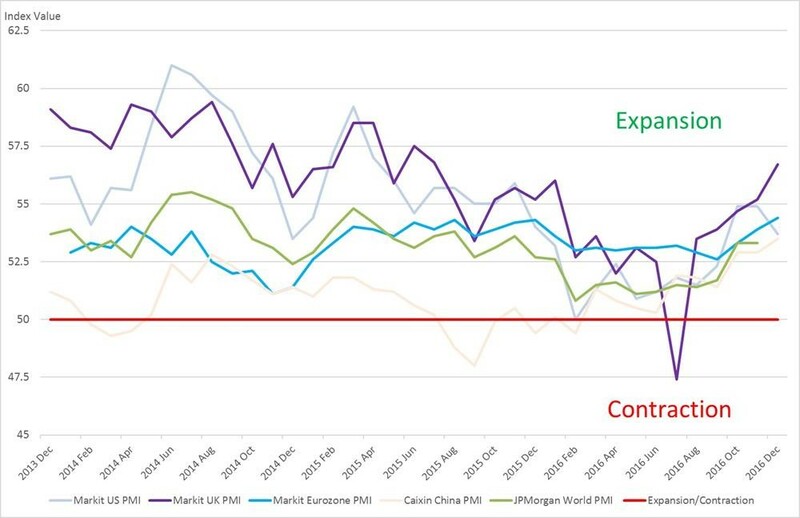 The PMI Composite Index (which gives a reading of the potential for expansion or contraction in services, construction and manufacturing sectors) for many leading economic regions increased during 2016 indicating economic expansion globally. PMI is by no means a perfect indicator and has in the past given false signals. However, it is one of a series of indicators that we follow and it adds to the sum of knowledge about what is happening across economies. The UK’s PMI figure for December was comfortably ahead of forecasts, recording its highest level since July 2015 at 56.7, surpassing the 55.0 mark predicted by economists. While the sharp recovery in the index during the second half of the year can be attributed in large part to Sterling’s devaluation which has boosted export orders, positive trends were also recorded in Europe, the US and China suggesting that the global economy is underpinned by business leaders making plans for future investment and growth.